So the downside to having 17 days off work is the unavoidable first day back. The end of my blissful vacation. The Monday of all Mondays. It's time to wash the powdered sugar off my Crossfit sweatshirt and start eating like a civilized human again. To kickstart my year, I've accepted a 30 day Paleo Challenge. From Jan 5 - Feb 4, I'm excluding processed foods, sugar, gluten, dairy, grains and beans. My Crossfit box is competing in a nutrition challenge, and I intend to win. Well, probably not win but I definitely want to hit my goals! What makes this kind of challenge even possible is that I have an accountability partner who's doing it with me. We each have our own goals, but we're headed in the same direction. We'll be sending our food diaries to each other every day, working out together 5 days a week, and calling each other when we're crying for chocolate. The most exciting part is that I'm using a 30 day meal plan from Practical Paleo, and I'll be cooking all sorts of fun/fancy/different foods. Here's a snap shot of my meal plan this week! Brace yourself for an outpouring of Paleo recipes. Can't wait to cook and share them all with you! So anyway, back to these freezer smoothie packs. These were loads of fun to make, and they're so convenient. Anytime you're too tired to make dinner, or too rushed to make breakfast, just take out a smoothie pack, put it in the blender with some almond milk and chia seeds, and there you go. The recipe below is for one smoothie, but it's best to buy bulk veg/fruit and make several. 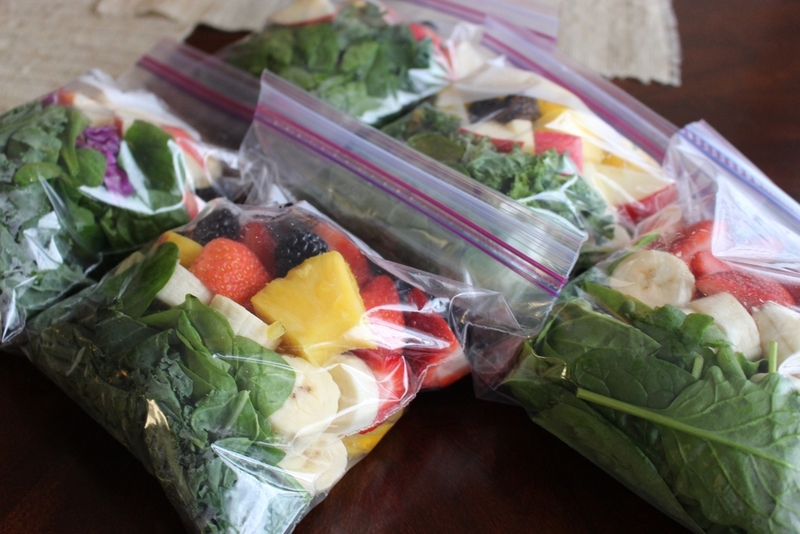 Get a quart sized ziplock, add your greens then your fruit, and stick in the freezer. When you're ready for a smoothie, take it out, put it in the blender, then add the almond milk and chia seeds. Depending on your blender, you may need to let your veg/fruit thaw a little while before adding it to the blender.